Click the boxes below to expand for detailed information on each category of service. 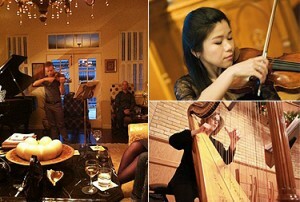 Experience the richness and splendor of world-class live string music on one the most memorable days of your life. MVSJ will create and customize a musical program uniquely aligned with your taste, style, and vision. Ceremony services usually include atmospheric prelude music for approximately 20 minutes followed by all ceremony music, a recessional, and a postlude. Cocktail hour music is often added to keep guests entertained immediately following the ceremony. Music selection with MVSJ (including custom requests) is a simple and stress-free process. You will have our creative guidance on your side every step of the way. From high elegance to high energy, MVSJ corporate event and reception music will get your party started and will keep it going. With our world class jazz ensembles, cutting-edge Wired!Pop/Contemporary Strings, our famous classical sounds, and our amplified guitar or cocktail piano, we truly offer something for everyone. 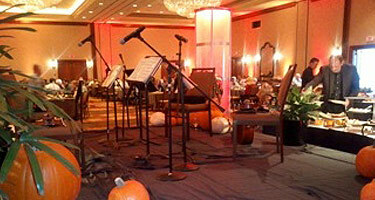 Our expertise ensures a smooth, simple event planning experience. Unique among Texas chamber music companies, MVSJ string, wind, and jazz musicians maintain an active schedule of professional solo, chamber music, and orchestral concerts. Individual member musicians perform regularly and under tenured contract with the San Antonio Symphony, Austin Symphony, The Opera San Antonio, and the Austin Lyric Opera. Other regular engagements include Victoria Bach Festival, Camerata San Antonio, Musical Offerings, the Carmel Bach Festival, the Grand Teton Music Festival, the Colorado Music Festival, the Aspen Music Festival, and the Santa Fe Opera. In contrast to performers who primarily play background music, this professional balance ensures the integrity of all MVSJ members’ skills over time. This in turn leads to an exquisite musical product at every MVSJ performance, whether in the background or the foreground. MVSJ will produce an exceptional musical performance while handling all logistical matters promptly, accurately and efficiently, allowing the organizer to sit back and enjoy the music. Rates for concert, religious, and cultural performances will vary depending upon repertoire and other factors of production. Please inquire directly. Andrew: It was a pleasure working with you & your quartet. That was the most solid & elegant “backup” I’ve ever experienced on the Mozart quartet. Dear Andrew, I wanted to thank you and Monte Vista Strings & Jazz for providing such incredible music at our wedding ceremony and reception. The string quartet and the vocalist at St. Marks were absolutely fabulous. Although most of the day is a blur, I distinctly remember hearing Canon in D as I waited in the wings. Watching everything again in the wedding video confirmed that every note was flawless. The duo at the cocktail hour was also amazing. The transition from the more formal strings to the classical guitar was the perfect segue into the celebratory part of the evening. Thank you again for your professionalism and your remarkable talent! I couldn’t dream of a more perfect soundtrack to the day.